Alfredo’s at the Inn is an Italian restaurant located in the Holiday Inn in Mayfield. It’s not Amp 150 in the Marriott, but it is a very good hotel restaurant, which is always nice to see. My friend loved the carved 16th century antique desk just outside the entrance, and the pumpkins lining the hallways were whimsical. The metal shelves lining the wall when you walk to the hostess station filled with bags of chips and the coolers of soda and bottled juices were a little disconcerting though. I felt it kind of detracted from the ambiance of the restaurant. The restaurant itself has very good ratings on Urbanspoon and Yelp, and I had initially heard about it on the local food program 3 Squares. I’ve been meaning to schedule a dinner with my dining out group here. When I read in the FR!DAY magazine that they were offering a clambake on Friday and Saturday nights in late September and October I knew I had to check it out. 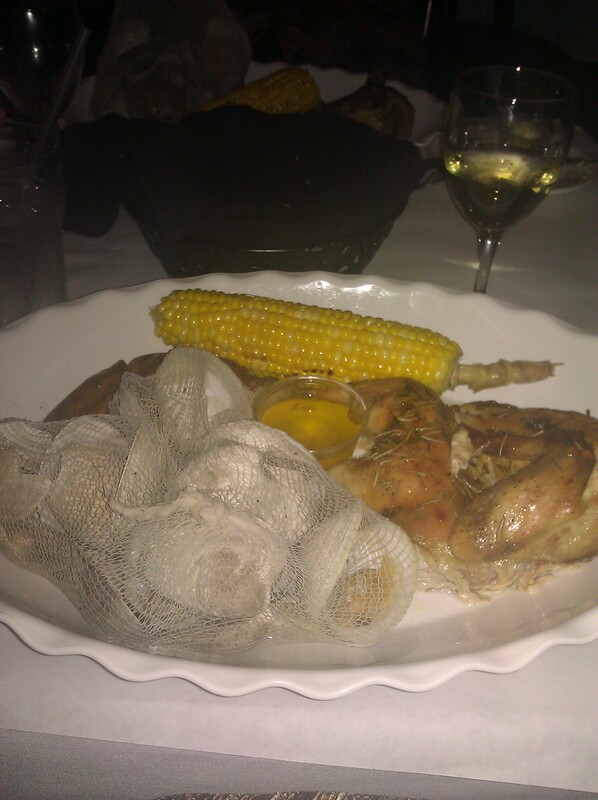 The clambake is $23.95 a person and offered a lot of food and value for the money. The parking lot was fairly full – as was the restaurant when we arrived at 7:30 this past Friday night. Despite that, my friend and I were quickly shown to a table and given menus and water. Even though I knew what I wanted I read through the menu and was thrilled to see they serve Beef Braciole. Not many restaurants serve braciole, which I came to appreciate several years ago at a friend’s aunt’s house the night before my first 3-Day walk. When our waitress came to the table to greet us we ordered wine and the clambakes. While we were waiting for our wine someone dropped off a basket of warm Italian bread and whipped butter. 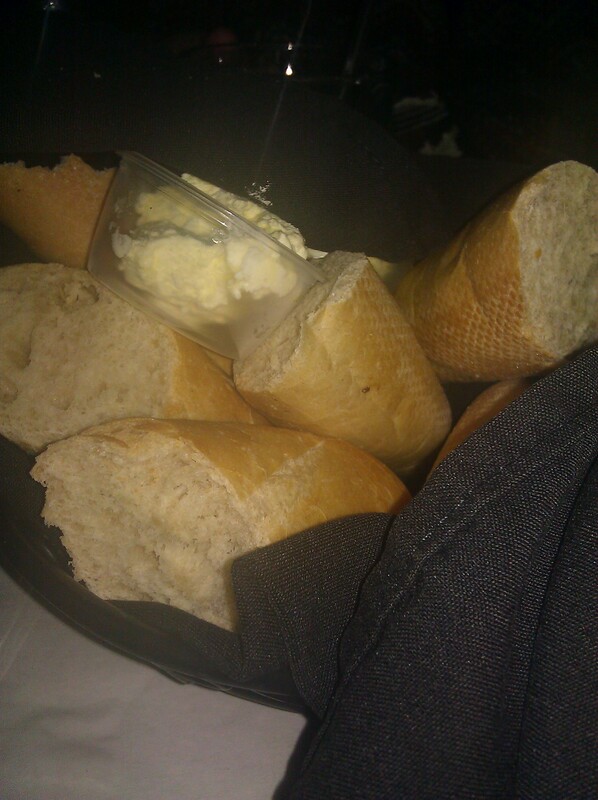 The bread was really good – crusty on the outside and soft on the inside, and we each had our own containers of butter. 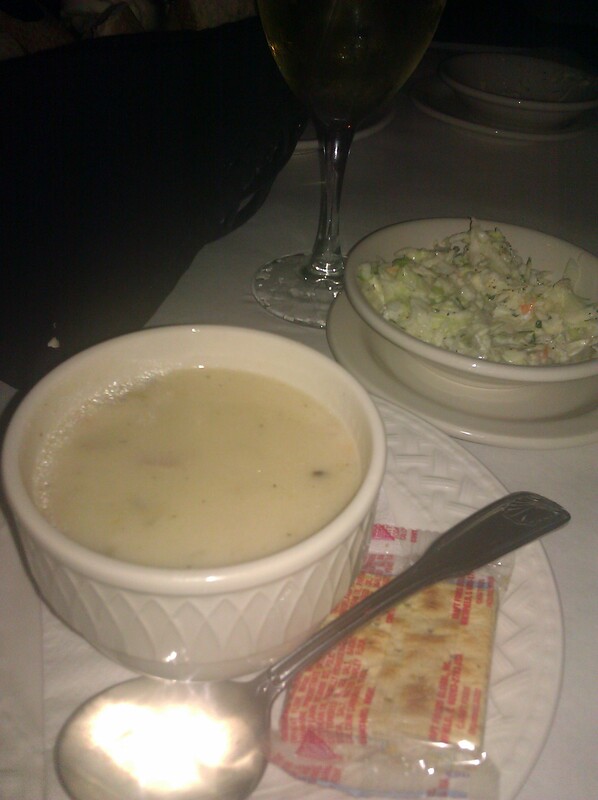 Our waitress quickly brought out our first course – a cup of New England clam chowder and creamy coleslaw. The coleslaw needed some pepper to season it, but it was quite good. The clam chowder was hot and delicious, with visible chunks of clam. The bake itself came out on a HUGE platter and included a dozen steamed middle neck clams, a half of a chicken roasted with rosemary and garlic, grilled corn on the cob, and a baked sweet potato as well as a container of melted butter. Being middle neck clams, the clams were a little chewy but very flavorful. A couple of them were gritty, but I feel that just shows that the clams are fresh. If they were in ice water for a while (or too long) they wouldn’t be gritty. The roasted chicken was fall-off-the-bone tender and moist. I love rosemary on chicken, so I was very happy. The corn on the cob was perfectly cooked – not mushy or hard, but just right. It had some nice char marks from the grill on it. The sweet potato was good, but that is never my favorite part of a clambake. We had some trouble flagging down our waitress after our food was delivered for more water, and even more trouble getting her to bring us the bill and cash us out. If she had bothered to ask us if we wanted dessert I would have probably ordered a chocolate covered strawberry. Not because I was still hungry, but because they looked amazing in the refrigerated case when we walked in. I can’t wait to come back and try some of the Italian entrees and the amazing-looking desserts. If the food tastes half as good as it smells I won’t be disappointed. If you love a good clambake and don’t have any friends hosting one at their home, Alfredo’s is a nice alternative. They’ll be featuring their clambake through October.